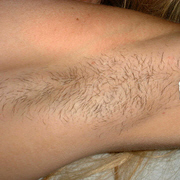 At last, there is a real solution to unwanted hair without the inconvenience of tweezing, shaving, waxing, or creams. Results are long lasting, and treatments are quick and easy. This simple procedure sends a Nd:YAG laser beam through the skin to reach the hair follicle under the surface destroying it whilst leaving the surrounding area unaffected. 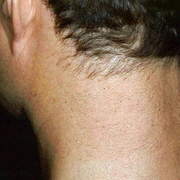 The laser beam has a large diameter and is able to reach several hair follicles at one time. Only hair follicles that are in their growing cycle will be affected; and so a number of treatments are recommended over a period of a few weeks, to ensure the best result. The Aesthetic & Laser Clinic uses the most advanced laser technology; cleared by the FDA for permanent hair reduction. The procedure is safe and effective for both men and women of all skin types and hair colours except for blond and gray. The pigment in the hair follicle absorbs Nd:YAG laser energy, while hair is in its active phase of growth. The laser light treats the follicle without harming surrounding tissue. You should avoid sun exposure to the treated area or use SPF30 sunscreen following any laser treatment. Since only 30% or less of your hair may be in the active growth phase, a series of treatments will be required to achieve desired results. These treatments are spaced approximately 3-6 weeks apart, based on anatomical position and hair growth cycles. You can expect to need from 4-8 treatments. 5) How permanent is hair reduction? You can see an average of 48% reduction in hair growth after three treatments and up to an 80% lasting reduction after six to eight treatments. Any remaining hair will usually be finer and lighter in colour. 6) What can I expect immediately after treatment? You might experience a slight redness in the area, which will resolve in a couple of hours. 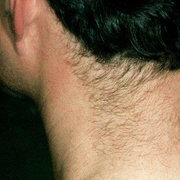 Hair follicle may grow for one to two weeks. Typically; these are lifeless hairs and they will fall out quite easily. 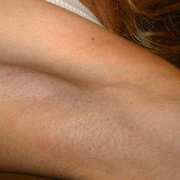 During the course of treatment, avoid waxing or plucking the area that has been treated. Consultation and test patch are free of charge. All the prices are a guideline and are per each session of treatment. For any other area please contact the clinic.